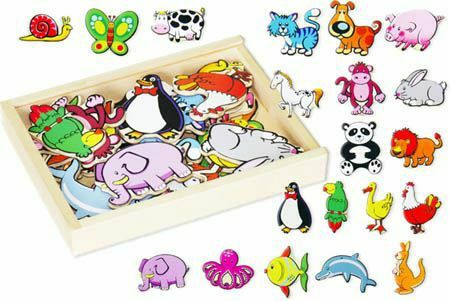 Magnetic Wooden Animal Shapes are a box full of 20 bright happy animals. These animals are waiting to be lined up on your fridge or any metal surface. A great toy to help with learning names and making up stories. There is a Bunny, Cat, Dog, Octopus.... to name a few, plenty of choice and lots to spark the imagination. We like this because: "A great toy to play with on the fridge while people are busy in the kitchen."